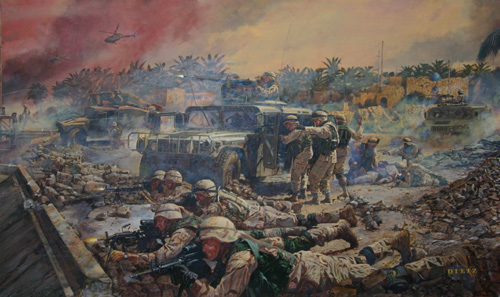 April 4th - 5th, 2003, saw elements of the 2nd and 3rd Battalions, 325 Airborne Infantry Regiment link up and begin their liberation of the town of As Samawah, Iraq, in support of Operation Iraqi Freedom. The liberation of As Samawah was a unique step in support of OIF because As Samawah was largely considered to be Sunni-controlled, and therefore more supportive of Saddam Hussein. The early morning hours of darkness found the town and specific areas targeted with mortar and artillery fire. The preparatory fires continued during the first hours of daylight with more support from Bradley infantry vehicles, Abrams tanks and Kiowa Warrior Helicopters. During this time, Task Force Falcon began their initial sweep through the town, painstakingly clearing every room and every building and flushing out the insurgents. Contact with the enemy was sporadic and light until mid-morning, when the situation drastically changed. After a night and morning of fighting, TF Falcon had moved into position along Highway 8 to seize the bridge there that had been deemed critical in cutting off a northern supply route to Baghdad. The bridge was in poor shape after a night of shelling, and it seemed dubious the bridge would be serviceable and taken intact. Initial probes to the bridge realized the true strength of the enemy; they had dug in and were entrenched in buildings and defensive positions across the river, wholly intent on keeping the bridge under their control. What began as light fire, fully escalated into a major battle. The fighting was so intense that medical helicopters could not land safely in the area to evacuate the wounded. After nearly four hours of fighting, Falcon Paratroopers were crossing the bridge when they encountered a truck full of propane tanks driven by two men bearing down on them in a suicide run. Paratroopers from D/2-325 AIR fired on the truck, striking the propane tanks, causing it to explode. One the city's westernmost bridges, C/2-325 AIR had a similar encounter with a taxi on a suicide run. Five hours after TF Falcon's initial contact at the bridges, As Samawah was considered to be under US control by MG Charles Swannick, the 82nd Airborne Division Commander. He praised the effort of the Falcon Paratroopers as playing the crucial part in the liberation of As Samawah. The painting "Bridges of Freedom" captures the spirit of TF Falcon in their quest to take the bridges during the liberation of As Samawah. Elements of TF Falcon are depicted in the painting during the initial stages of the battle. The officers and soldiers of the 325th Airborne Infantry Regiment commemorate this painting to all members of the Regiment - past, present and future. The courage and determination displayed by the paratroopers of the 325 AIR serve as a constant reminder of the sacrifices of the past and our continued service in the future.